The Nikon D3200 dSLR camera is packed with fabulous features like a 24-megapixel sensor, full HD video capability with fulltime autofocus, and 4 frames-per-second continuous shooting mode. This full-color guide provides instructions for all the buttons, dials, modes, and menus plus a refresher course in photography basics. It illustrates the essentials of lighting, composition, and exposure with plenty of examples, and author Alan Hess, veteran concert photographer, even includes professional tips on improving portraits, candids, sports and travel photos, and much more. Sized to fit in a camera bag, the book includes a bonus gray and color checker card to help dSLR newcomers capture perfect white balance and color every time. 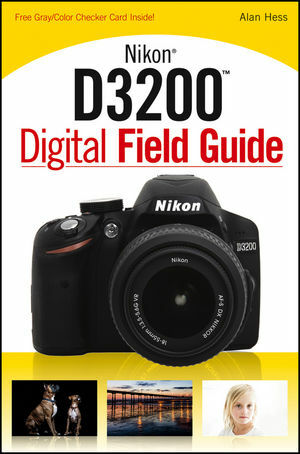 Nikon D3200 Digital Field Guide is your new Nikon's best friend. Take it everywhere you take your camera and have expert advice at your fingertips. Alan Hess is a commercial photographer who specializes in concert and live-event photography. He is the house photographer for a large concert venue in Southern California, and is considered an expert on Nikon cameras. Alan's other books include All Access: Your Backstage Pass to Concert Photography, Exposure Digital Field Guide, and Composition Digital Field Guide, all published by Wiley.